Sometimes staying where you are just feels easy, but it's only when you move that you realise how uncomfortable you were and how great the new place is. That applies perfectly to broadband deals. Switching could mean faster internet, cheaper bills, a more reliable connection and even greater freedom of contract. That all sounds great of course, but if it means hassle many people will stay in discomfort for the ease. But it turns out the switching part is easy, too. Thanks to rules from Ofcom, it's now easier than ever to switch broadband provider to enjoy better internet for you. Now it's often left to the providers to do the work. You don't, in many cases, even need to let your current provider know you're leaving – the new service provider should tie that all up for you. The reasons could be many or it could be a simple push. The obvious reason is to save money or because you want a faster internet connection. But maybe you're moving house. Or perhaps you just need a more stable and reliable broadband offering than you're currently getting. Have the likes of BT Broadband or Virgin Media turned your head with a new offer? Maybe you're working from home more and want to be sure you have the best line possible. Or have you just got a 4K and HDR TV and want to have enough speed to get the best out of it? First you'll need to find your new provider. Our dedicated guide to the UK's best broadband deals or the price comparison at the bottom of this page are the perfect jumping off points. Generally it's best to get your cancellation date confirmed and then book in the start date for the new provider, in order to avoid overlap or a period where you're left without a connection. 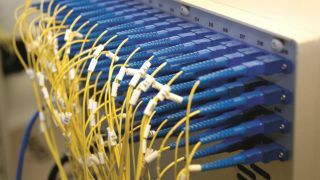 If you're moving to fibre broadband, for example, you may need a new line installed. Or, in some cases, you might need to sign-up for a phone line which could require installation if you don't yet have one. Generally you want to leave yourself about two weeks for the switch to take effect. Of course this varies depending on providers and can go on for up to six weeks. You have a 14-day period after entering a contract with the new provider where you can cancel for free. So, generally, most providers will have you set up within that time. As mentioned above, you can now switch providers easily where the new provider does the organisation work for you. The issue comes with cancellation fees. If your contract stipulates you need to pay a fee for leaving early, you'll need to factor that amount into your decision. Sometimes you can still save money on a new cheap broadband deal even with that charge paid off. There are instances where that fee may be waived. If your provider increases the monthly fee more than the line of inflation then you can walk away without paying any charges. Or if the provider is in breach of contract by not providing the speed it claims, or perhaps not being as reliable as it should be. Can I keep my phone number and email? Based on Ofcom regulations the provider has to let you take your landline telephone number if you're staying at the same address. If your new provider makes this an issue you could always port the number across to VOIP for a one-time fee. For email, provided by the broadband company, this generally is left alone. If not, you can set up auto-forwarding to get your email on a new account like Gmail or Hotmail which may fix the problem.